Read more in an excerpt from Washington State Magazine. She taught for a few years at Cal State University in Fresno, in the heart of one of the planet’s biggest food producing regions, the Central Valley. “That really opened my eyes, the scale of ag,” says Whitley. Whitley and Pablo Monsivais, a public health nutrition expert and associate professor in WSU’s Elson S. Floyd College of Medicine, say that people have the knowledge to eat healthfully, and will if given the opportunity. Both the sociologist and the public health expert point out that the growing obesity epidemic is connected to food insecurity, as are a host of other health issues. Ryan Lazo, the community partnerships coordinator at the WSU Center for Civic Engagement, works with food activists throughout Whitman County and beyond. With Joe Astorino (’15 PhD sociology), the director of Pullman’s Community Action Center (CAC), Lazo runs a food recovery program in collaboration with WSU Dining Services. They take food from dining halls that would otherwise go to waste to a commercial kitchen at the CAC, which is then distributed to the county’s many food pantries. The food recovery program, Lazo says, “started small, but it’s growing.” At a 2015 Pac-12 cross country meet, Lazo and his partners “recovered leftover fruit and granola bars, and took them to the food bank.” Since then, the program has grown and stabilized. The recovery team even takes lentil chili left over from Pullman’s annual Lentil Festival, packages it in family-sized portions, and freezes and distributes it to those in need. “Now, on campus, things are fairly standardized,” says Lazo. “Recoverable food is gathered at the Southside dining hall and once a week it is delivered to the CAC for repackaging.” From there, Astorino says, it is distributed around the county. But distances are great. 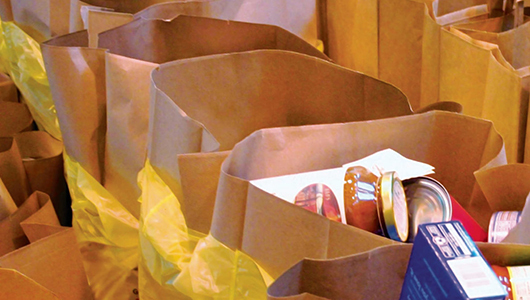 Astorino says that a full circuit of Whitman County food pantries takes a couple of days. Keeping perishable food fresh is a problem. Indeed, the logistics of food distribution inspired Nils Johnson, a WSU Extension educator in Stevens County in the remote northeast of the state, to a cool solution. Johnson, a former high-tech engineer turned food activist, designed a mobile refrigerated trailer so, instead of having to take a refrigerated semi-truck into remote areas with a commercial driver at the wheel, the CoolPup—as Johnson calls the built-to-purpose rig—can be towed behind any six-cylinder vehicle. Changing the way food is distributed is one way we’ll beat food insecurity, Johnson says. And it’ll provide a double bang. Johnson describes a loop through Ferry, Pend Oreille, and Stevens Counties, a 250-mile round trip, that encompasses food pantries, as well as rural schools and hospitals—all hungry for fresh food. It also crosses paths with dozens of small farmers hungry for a market. Top image: Grocery bags image featured on Washington State Magazine.